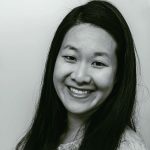 Published Apr 24, 2018 By Julia 31 CommentsThis post may contain affiliate links. 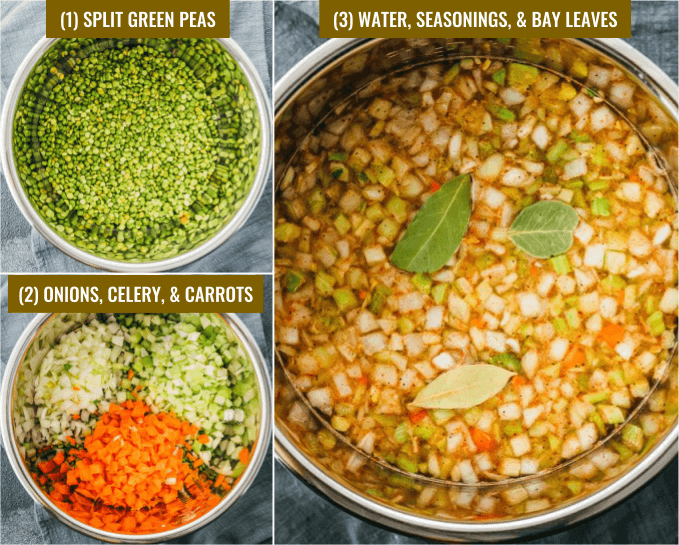 A comforting Instant Pot recipe for split pea soup that’s a dump-and-go type of meal. Vegetarians can enjoy it meatless, and meat lovers can add ham bone or bacon. 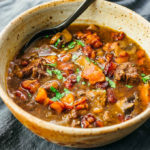 Pressure cookers like the Instant Pot are great for breaking down tough cuts of meat and vegetables. Want something crispy? Stay away from the pressure cooker. 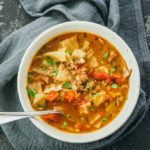 But if you’re craving anything soft and tender like stews and soups (see Instant Pot Broccoli Cheese Soup and Instant Pot Cabbage Soup With Beef), the pressure cooker is your friend. This split pea soup is thick and creamy, with a texture similar to potato soup, but without potatoes. The green peas, onions, and celery are easily broken down by pressure cooking, adding to the viscosity of the soup, and there are occasional bites of carrots. There’s also a very slight heat to the soup due to the smoked paprika. You can enjoy this as a vegetarian meal, or add leftover ham or ham bone if you’re coming off a holiday feast. Another option is to add some diced bacon. 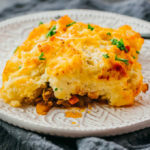 Either way, it’s a very simple recipe where you can dump all of the ingredients into the pressure cooker, turn it on, and come back later to a delicious meal. 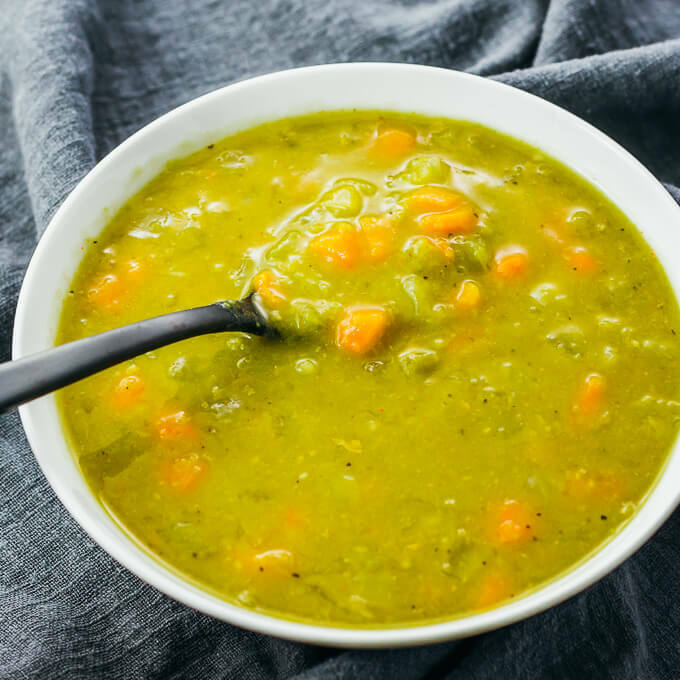 To make split pea soup, you’ll need water, dry split green peas, vegetables like onions, carrots, and celery, some minced garlic, a few bay leaves, and seasonings like paprika, salt, and pepper. The soup is vegetarian and vegan as shown. Interested in saving time? You can make this a no-chop recipe by buying mirepoix, which is a pre-diced package of onions, carrots, and celery. I buy a 14 ounce tub of mirepoix from Trader Joe’s, which is the equivalent of half an onion, 3 carrots, and 3 celery stalks. I use water as the liquid base, not broth or stock. In my cooking experiments, I tried using broth instead, but didn’t find any noticeable difference in the end result. Since it’s easier to use water, that’s what I recommend and use. You’re welcome to substitute with vegetable broth or chicken broth, of course. I’ve also experimented with various liquid levels ranging from 6 to 8 cups. With 6 cups, the resulting soup was too thick, almost like a split pea puree. With 8 cups, it was too thin and watery. I found that 7 cups of liquid is ideal. You can adjust this amount if you prefer your soups to be on the thicker or thinner side. Note that split pea soup thickens substantially as it cools. You can serve split pea soup with pita chips or bread. If you’re following a low carb diet like me, you can serve with almond flour crackers or enjoy the soup by itself. If you have too many leftovers, you can freeze the soup, but note that the texture won’t be the same after defrosting — it’ll be less smooth. For this reason, I usually refrigerate leftovers and avoid freezing. 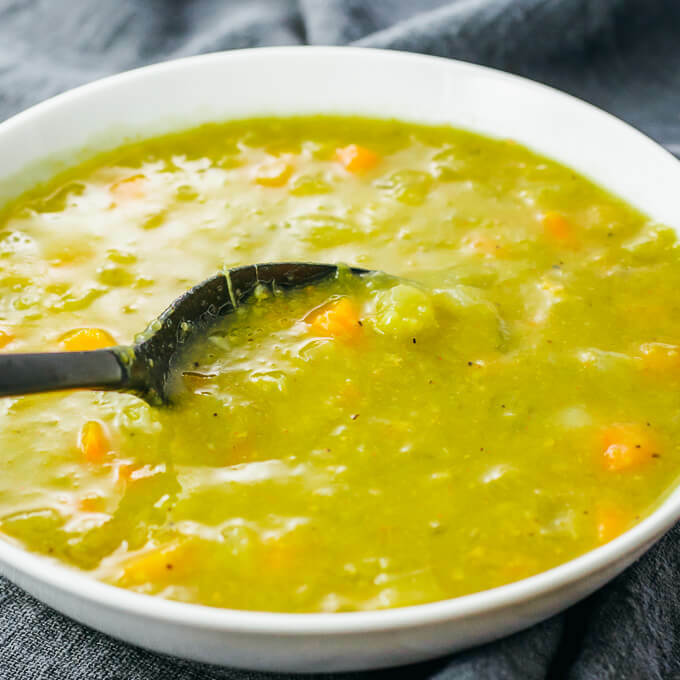 A comforting Instant Pot recipe for split pea soup that's a dump-and-go type of meal. Can be enjoyed meatless, or with ham bone or bacon. Add all ingredients to the pressure cooker pot and briefly stir them together. Secure and seal the lid. Cook at high pressure for 15 minutes, followed by a 15 minute natural release. Manually release remaining pressure. Uncover. Remove the bay leaves (and ham bones, if used) and stir the soup. It will be very hot, so let it cool a bit before serving. Serving size is 1 cup. I just made two pots of this. One vegan and one with ham. I love my vegan pot. I used some ham juice from a ham that I baked yesterday for some of the water in the second pot, then added some leftover diced ham after the pressure was released. My husband said that it was the best I’ve ever made. Thanks!! Sounds delicious. Thanks for sharing your feedback, Barb! Being a vegetarian,, I would like to know if I can use liquid smoke in place of meat ? You can omit the meat entirely without substituting with something else. This sounds delicious! However, I would like to have potato chunks in my soup. 😁Therefore, when would you recommend adding potatoes (and any additional water)? See below comment by Deb McKay. She added potatoes with an extra cup of liquid and it worked out well for her. I make many soups and split pea is my favorite soup, but I never made it because I feared putting all that effort into a recipe and then be disappointed. I saw your recipe this week & decided to give it a try because it sounded so easy. It is easy and awesome! Love the smoked paprika – gives the perfect flavor. I used chicken broth and added two diced Yukon gold potatoes, with an extra cup of liquid. I am so happy with the soup and will be a regular part of my rotation. THANK YOU!!! Came out AWESOME !!! ADDED lots more carrots, and gelatin from ham pan (2cups). Then 4 cups water. Used bean button on mine. Have I think, 35 minutes. Used to take hours !!! This was a great find !!!!!!! A 10. Ps. Measurement S on veggies are to taste… Water is exact !!! You can add water after cooked if needed. I did need to. Just made this in my Pampered Chef quick cooker and it turned out amazing! Great recipe! I used the soup/stock setting and cooked for 15 minutes on high pressure. Fabulous use of our leftover Christmas ham bone! I love the Quick Cooker. I adapt any IP recipes for it. This is next! The recipe is really good as is, however, I adjusted it slightly to suit my families personal tastes. Removed all meat. Added 1 tsp Cumin and 1 tsp Chipotle Powder. Next time I make some vegetable stock in my instant pot i’m going to reserve some for this recipe and see how that tastes as well. This is a keeper recipe! Thank you! Homemade stock is the best. I love your spice additions and I’m going to try adding them next time. Can this instant pot split pea soup be made in a regular large kettle. This recipe is designed for an electric pressure cooker, so adjustments would have to be made in your case. You would likely need to increase the amount of water as well as increase the cooking time. You can make in a kettle, but needs more water and a LOT MORE TIME. Pea soup tends to settle on bottom of kettle, and needs to be stirred a LOT. Also, if not watched is can BURN on bottom. I made it a lot in the old days, but never again on the stovetop !!!!!! AMAZING!!! Followed the recipe 100%. I did put it all together, turned on the Instantpot and left to run errands. So by the time I got back it was done, had naturally released the steam and was warming for almost an hour. Not thick at all, flavor is beyond delicious. I would highly recommend using a ham bone to get the Smokey flavor. This will become a family favorite!!! I’m glad you enjoyed this, Tunde. I love recipes that are incredibly easy like this one. I made this recipe adding ham at the beginning and it turned out great. Good flavor. I think I may add a diced potato next time but will definitely make this soup again! Yep! I kinda abandoned my slow cooker after getting my Instant Pot. I made this in my IP and it was AMAZING!! My Husband and I brought it to my parents for a nice warm dinner and my Dad absolutely LOVED IT!! 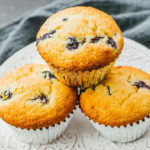 Thank you for this recipe, I will definitely be making again and again! You’re welcome, Sue! 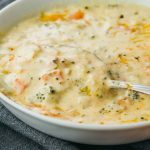 This is one of my husband’s favorite soups… can’t wait to make this more often as the weather cools down. If I were to use bacon, when should that be added? At the end? If it’s already cooked, you can stir it in at the end. If it’s raw, you can add it at the same time as the other ingredients. Do you put the bacon in raw or cooked? If you add any kind of meat, I would add it after it’s been cooked, like leftover ham. 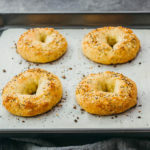 Is this recipe for the larger instant pot? I have the 3 quart. That’s correct, this recipe is developed for a 6 quart Instant Pot. I haven’t tested it with a 3 quart version. Not sure it would fit in a smaller instant pot, you may need to halve the ingredients. 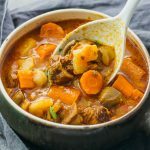 Can I make these recipes like chicken stew & split pea soup in a slow cooker or stovetop and not a pressure cooker please?? The ingredients would probably work, but the instructions would be different for a slow cooker or stovetop cooking method. Mirepoix is a LIFESAVER. Thanks for sharing! !